Is a Monet 95 points and a Renoir 94 points? Wine is art. It is art in a glass, and grading wines on a point scale like they do in Consumer Reports is fine for cars and refrigerators but it’s a terrible way to think about wine. The point system of evaluating wine has turned it into a technical commodity and resulted in a homogenization of wine styles. In other words, it’s the wrong way to think about wine because wine is art and we don’t think about art like we think about a refrigerator. Wine is art in a glass. Yes, in the “new world” we’ve tried to make it a science but great wine is always a work of art, and If wine is art then why do we treat it like it’s a used car? I mean, we don’t look at a Monet and give it 95 points and then look at a Renoir and give it 94 points. We don’t rate it on performance and reliability like we do used cars. Instead we look at great art and we evaluate it on how we experience it. We either love it or we don’t. It’s a completely subjective evaluation based on what we like and don’t like and the same should be true with wine. When we look at great artistic masterpieces we let them engage us. We may find the details interesting but only after we’ve fully engaged the art. Who cares if it took Monet five years or five minutes to paint his masterpiece. It’s amazing and I love it. To further the point, we don’t ask how much blue was used in Monet’s Lilly’s or what percent of green is in them. The same is true with wine. If a wine is 80% Cab and 20 % Merlot or vice a versa it really shouldn’t matter. What matters is – like great art – if we like the wine or not, and how it engages us. Here is how I think we should evaluate wine. We should let the wine engage us in the same way we let great art engage us. It should be about how the wine engages our senses, from the color, to the smell, to the taste and even the sound of the popping of the cork. All of our senses are engaged with wine just as our senses are engaged with great art. Some wine is like a childs fingerprinting – it’s not good but you want to encourage the creativity. Some wine is like paint-by-the-numbers – it’s simple and not very creative and anyone who picks up the kit can make it. Other wines are like modern art. They are “interesting,” but you wouldn’t want them in your living room; or maybe you would. Really great wine, like really great art, is rich in color and expression, shows depth and layers and cannot be fully grasped with one sip or one look. This is the biggest difference between truly great art and just art and is also the difference between really great wine and just wine. For some winemakers the goal is to make a big concentrated wine that is consistent from year to year so that the consumer can taste the same thing every time he buys the wine. This is what Coca Cola does. Every time you buy a Coke you get the same thing. Coke is great but it is not great art. The goal of the winemakers I love is to make a wine that reflects their vineyard, and their personality, and is somewhat consistent, but not the exact same every year. I love to taste a wine from one of my friends in Bordeaux and know that what is in the glass reflects their vineyard and their personality. I can sip a wine from Thomas, Pierre-Emmanuel, Patrick, Stephan or Christine and it takes me immediately back to walking in their vineyard, or tasting the wine from their barrels. They are each great artists and I love what they create. Today, the science of winemaking has enabled winemakers to do a much better job of working in their vineyard, and they are using modern technology in the chai to make higher quality wines, but the truly great ones have not lost the art of it. The wines I love are a work of art every year because every year depends upon the weather and in every vintage the artist is dealing with a different set of “colors” to blend. In Bordeaux a winemaker knows every inch of his or her vineyard and he or she treats every plot as a separate entity. He or she literally harvests the various plots separately and when the wine has fermented in the barrels they pour a sample from each barrel into a glass, put them all on a table and this is the pallet they work with. They then begin to sip and decide what the blend will be. The real art of winemaking comes when the winemaker blends his or her wine. They take the fermented juice from the various plots and blend them to make their masterpiece. I no longer think about wine from a numeric point of view. I don’t engage art that way and I don’t want to experience wine that way. What I’m really looking for, and the only wines I want to import for members of my club, are wines that make me say – like I say with great art – “Wow!,” or for the ones that really blow me away, “OMG!” These are the wines that make me stop, swirl the wine some more, stick my nose back in the glass and admire the work of art I am tasting. I take another sip and say, “Wow!” just like I do with great art. I remember the first time I saw the Impressionists at the Musee D’Orsay in Paris and I thought: Wow! It was the same the first time I tasted a really old Bordeaux. Wow! Occasionally there is a wine that captures me and I am truly blown away. I savor every sip and almost feel sad when the bottle is finished. Those are the wines that make me say, “OMG!” That’s how I felt the first time I saw Michaelangelo’s David. I stood there and thought, “Oh my God!” and I didn’t want to stop staring at it. It’s also the way I felt the first time I tasted ’82 Lafitte. I never get tired of great art, and I never get tired of WOW and OMG wines. If only I could take a bottle of OMG wine in to see the David! Our last day in Bordeaux was bound to be a great one, but it started off with a panic. I woke in the morning remembering some of the wines that we had collected from the Left Bank and realized that I never saw them in the blind tasting. Somehow in the collected mass of wines at Wayne’s shop we had missed six wines and now we had to do another blind tasting of these six before we started on our tasting of the Right Bank. I went to the Brasserie at the Relais de Margaux and fortunately one of the guys whom I’ve know for several years was working as the manager. I asked him if we could set up a blind tasting in the restaurant just prior to lunch and he loved the idea. I retrieved the wines from Waynes, told the group what had happened and what we would do and we assembled for our pre-lunch blind tasting – pictured above in the right column. We tasted the six wines and two of them blew me away. I was really glad I had remembered them but disappointed that we didn’t taste them with the others. We then went outside to the patio overlooking the golf course and had the wines with lunch. Once again, the wines were even better with food and now we have a very good showing from the Left Bank for the club. All this tasting wine and eating was exhausting and everyone was tired so we took the rest of the afternoon off. Around 4:00 we assembled again at Cave L’Avant Garde to taste the twenty-one Right Bank wines we had collected. 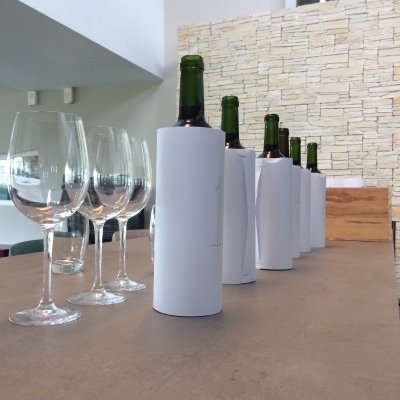 We usually have a point scale for our blind tastings like Parker or Wine Spectator but this had become a little cumbersome when tasting the Left Bank wines so I changed the format a little for the Right Bank. I told the group that really my scale is this: OMG, WOW, Great, Good, OK and Oh My NO!. Only OMG’s and WOW’s are worth considering for the club but you really don’t know until you taste them with food so anything on the bubble we will take to dinner. I’m not doing reviews of a ton of wines that will appear on shelves so it’s really not important what I think about a wine I’m never going to put in the club. The only thing that really matters is that I find a wine I will send to our members. I’m picking wines for the club and only wines that really impress me make the cut so this is a great evaluation scale. This made our tasting much more simple and direct. If a wine didn’t blow us away we didn’t consider it. Of the twenty one wines, four made the OMG or WOW category. This combined with the wines from the Left Bank and a couple we picked last year will make an outstanding selection for 2017. We took twelve wines to dinner (including some “Great’s” that were on the bubble of being WOW’s) at the Relais de Margaux, and it is always amazing how some do better with food and some do worse. We loved Pierre-Emmanuel’s wine as well as Patricks and the ones from Bourseau so it was great to take the covers off the bottles and see that we loved a wine that we had visited. We are in great shape for 2017 and will have another amazing collection of wines for our members. At dinner we discussed the week and the “best and worst” of our time together. We finished the evening again with a glass of Sauterne on the deck, but it was cloudy so we couldn’t see the rising moon; we had to just enjoy the Sauterne. It had been a wonderful week and I am glad my friends from the US got to meet and enjoy my friends from Bordeaux. I’m glad they got to be part of the whole wine searching/tasting experience and it was really fun to share it with them. The next morning I left on an early train to meet Deb for the rest of my time in France and reflected back on a fantastic week. It was a wonderful time filled with great people, and great wines. I think back on Thomas, Pierre-Emmanuel, Patrick, Marie-Dominique, Laurent, Stefan, Christine, Guillaume and of course Wayne and Cathy – without whom we couldn’t do any of this. I think back on some of the truly amazing wines we’ve collected in the past ten years. The ’09 and ’10 Pierhem, the ’05, ’06 ’09 and ‘-10 Reclos, the ’08 Vieux Mallet, the ’05 and ’09 St Brice, the ’08 and ’09 Tour Bicheau, the ’06, ’08, ’10 Bourseau, the ’11 Clement St Jean, all of the Beau Rivage’s and Clos la Boheme’s and many more I’m not thinking of right now; the list goes on and on. I’m sure you have your favorites and I look forward to adding many more to that list. It’s really incredible that I get to do this, and as I look back on the past ten years I continue to be amazed and I’m already looking forward to next year. Thank you for making it possible. But it didn’t end here. I found two more wines in my travels that are amazing and I’l tell you about them in the next newsletter. I was excited to spend the final three nights of our trip in my favorite place, and home base in Bordeaux for the last ten years, Margaux. This sleepy little town is the home to some of the biggest names in the wine world including the Premier Grand Cru Chateau Margaux, and the powerhouses of Ch. Rasan Segla, Ch. Lascombes, Ch. Palmer and a host of others that firmly establish this as part of the high rent district in Bordeaux. I became attached to this little slice of wine paradise when I stopped into Cave L’Avant Garde in 2004 because they had a sign outside that said “We ship anywhere in the world.” We lived in Canada at the time and I didn’t believe they would ship there – they didn’t – so I had a couple of cases shipped to my parents home in North Carolina. The following year I celebrated my fiftieth birthday in France with friends, and we began with two nights in Margaux. On the first night a group of us walked up to Cave L’Avant Garde to buy some wine for dinner and I met the owners Wayne and Cathy for the first time. They had some wines they wanted me to taste and I invited them to bring them over to the hotel and sit outside and enjoy them with our group. Much to my delight and surprise they agreed. The rest, shall we say, is history. In 2006 Bill and I took our sons to France for their High School graduation and the four of us were having lunch at the Relais de Margaux (where I stay when I’m in town) when we came up with the idea for the club. We went directly to Cave L’Avant Garde and asked Wayne if he was interested in being our contact on the French side of the business and he immediately agreed. I’ve spent at least a week there every year since 2006 and I always feel like I’m coming home when I arrive. On this morning we would have our final “wine pick-up” at another one of my special places – Chateau Beau Rivage – with two of my favorite people, Christine and Guillaume. Christine’s family owns the Nadalie Cooperage – a barrel making operation whose barrels I see in chais all over wine world – and while her brothers make the barrels, Christine (pictured with me in the column on the right) makes the wine. Whenever I visit a winery I look in the barrel room to see if they are using Nadalie barrels and most of the time they are. Christine makes great wine – both Chateau Beau Rivage and Clos la Boheme – and we have enjoyed several vintages of each in the club. Guillaume works for Christine as a sales rep for both the barrels and the wine, and I have been working with him for the last six years ever since we took the 2002 Chateau Beau Rivage in the club that some of you will fondly remember. I wish I still had some. We arrived at the tonnellerie office and were greeted with big hugs from Christine and Guillaume and it is always great to see them both. Christine let Guillaume give us the tour and he began by showing us the fascinating and labor intense barrel making operation. We started by walking though the yard where they keep the wooden slats that will become barrels, then on through the factory that molds them, toasts them and finally closes them up for delivery. Guillaume is a great guy and as we pass by each “station” in the barrel making plant he shakes every hand and chats a little with each man. He is that kind of guy. From there we drove over to Chateau Beau Rivage and spent a few minutes in the vineyard before going in to the chai to taste the wines. Christine had just blended the 2014 vintage the day before we arrived and she didn’t want us to taste it – too young – but the cellar master poured it for us anyway and it is wonderful! When I taste a wine this young, I am really just looking to judge the density of the fruit and the complexity, including the tannins that remain on my pallet. I can’t wait to taste it next year when it is ready. After our tasting we returned to the tonnellerie where they also have a very nice restaurant and Christine joined us for lunch. We shared a beautiful lunch with Guillaume and Christine and washed it all down with some of her wines; an absolutely delightful dejuner with Christine regaling us with stories of winemaking and what it was like to grow up with three brothers. I really enjoy these two people and would have liked to hang out with them all afternoon, but we had one more chateau to visit and then our first blind tasting so by 2:00 we said our “good byes” and departed. We left Beau Rivage and drove back to Margaux and our appointment at Chateau Lascombes, one of the best and most popular wines in Bordeaux. This is another fairyland chateau that is covered with beautiful green vines on the exterior and has a glass domed ceiling in it’s tasting room that is absolutely gorgeous. They work very hard to make great wine and it shows. At the end of the tour the guide explained that she thought we were all wine professionals and she had prepared a different kind of tasting for us. She was a little apologetic but we were thrilled. We’d been doing the standard tasting routine for a week and it was awesome to try something different. Instead of tasting from different vintages of Chateau Lascombes, we tasted the individual varietals that went into the blend and then finally the blended wine. Amazing! This was an incredible way to taste and one I had never done before. The remarkable thing was that the individual varietals – merlot, cabernet sauvignon, and petit verdot – where each huge and massive by themselves but the blend was soft and elegant, exactly what you expect from at top wine in Margaux. I have no idea how they make this happen but every sip was fabulous. It was an incredible tasting and I was really glad we stopped here. By 6:00 we were at Cave L’Avant Garde and ready for our first blind tasting. Patrick from Chateau Tour Bicheau showed up to join us in the tasting and I was thrilled to see him. We began with the Left Bank wines since Patricks wine is with the Right Bank group. Many years ago I made the mistake of having a winemaker join the blind tasting that included his wine. I didn’t like the wine, gave it a bad review and when we pulled the cover off the bottle I was very embarrassed. Lesson learned; no more blind tasting with winemakers whose wine is in the assembled group. I love it when a winemaker joins us for the blind tasting, but now they only taste other wines. When everyone was done tasting we compared notes. There was not much agreement on the wines, and Patrick didn’t give great scores to any of them – typical of winemakers from the opposite bank – but I thought there were some real standouts in the group. We were considering wines mostly from the difficult 2012 vintage and while it is a tough vintage there are some good wines. The trick is to sort through all the plonk and find the really good ones. We choose ten to take to dinner with us. We gathered the bottles and headed up the D2 to Lion D’Or in Arsac, one of the more famous establishments in the Medoc. Two years ago the young chef bought the place from the former, legendary owners and he is doing a fabulous job. I had several wonderful meals there last year – including our wine tasting – and they remembered me as soon as we walked in. They set up a big table on the back terrace and we hauled in our collection of wines, ordered our meals and relaxed after a long day. Three of us had the beef on the menu, and they set up small table next to ours, brought out the beef on one huge plate, placed it on that table and started carving it for us. It was more beef than I’ve ever seen served and after the three of us ate as much as we could we had only finished less than half of what they brought. Then for desert, they brought the largest ice cream dish I have ever seen. It’s no wonder I’m beginning to look like Orson Wells! The wines paired well with the food and there are several that I am very excited about and will be great for the club. Several had changed dramatically after they had been given the chance to open in the couple of hours since we first tasted them blind and they were really beautiful with the beef. I am feeling good about our Left Bank selection and excited for you to enjoy these great wines next year. At almost 11:00 we drove back to the hotel (yes, we had a designated driver) and a few of us were in the mood for a nightcap. We took a bottle of Sauterne and walked around to the back porch overlooking the golf course to put a final closure to our day. We sat in the dark, sipping the nectar of the God’s, watching a fiery orange moon rise over the vineyards and thinking how fortunate we were to be there. It was a truly magical end to a glorious day. Tomorrow the Right Bank. When I was planning this years trip I knew I had to include a couple of tours at some of the big “name” Chateaux, including a Premier Grand Cru if I could. I have done the tour at Mouton Rothschild several times, and while it is excellent I wanted something different. Unfortunately both Chateau La Tour and Chateau Lafitte Rothschild require reservations many months in advance and I was out of luck, so back to Mouton it was. Our guide for this tour was a lovely young woman who knew her stuff inside and out and whom I remembered from a previous tour. She adores her employer and it showed in her love of the place, it’s history and it’s wines. The only drawback of the tour was that they assigned a couple from Georgia (“the country, not the state,” they informed us) to our group and they were shall we say, unfortunate. They are winemakers in Georgia and it seemed as if their purpose for the tour was industrial espionage. They asked every question about everything multiple times, which bored me to tears, annoyed our guide and made some in our group wish for the goulog. It was excruciating to listen to this guy ask the same questions over and over as if he was impressed by hearing himself repeat the questions. At the end of the tour we were squeezed into a tiny room and offered a taste of 2007 Mouton Rothschild. It was ok; and I’m being gracious. If you have ’07 Mouton in your cellar see if you can sell it and buy something great. The tour was finally over and at 40 euros a person I won’t go back. C’est tragique. Time for lunch. We drove the short five minutes into the petit ville of Pauillac which adorns the bank of the Girande river and is definitively a working town. You would never know this is ground zero for the world of fine wine simply by driving through. The river itself is an unattractive muddy brown, and the town has nothing remarkable to recommend it. There are three or four good not great restaurants along the quai and we choose one to sit and talk about the disappointing tour at Mouton and the Georgians. I had moules (mussels) for the only time on the trip – they were absolutely delicious – washed down with something forgettable at a fraction of the price of the unfortunate ’07 Mouton. The one really redeeming thing about Pauillac is the Tourist Information center which is excellent, has always been staffed by very helpful people and is great at assisting visitors in understanding the complex region of the Medoc. After lunch we stopped there briefly and walked along the quai before heading to our next appointment at Chateau Pichon Longueville. Piton Longueville (pictured above) is a fabulous chateau that is stunningly beautiful. It is probably the most photographed chateau in the Medoc because of the beautiful “pool” of water in front of it, the staircase leading to the doors and the spiral turrets that grace it’s sides. It could easily be in the Magic Kingdom! I chose to visit here because at the Bordeaux 1995 tasting we held at the Union League this had been the wine of the night. I was expecting an average tour and frankly after Mouton anything would have been great. We again had a wonderful guide and this time – without ex-Soviets in our group – our tour went swiftly and beautifully. Seriously, after you’ve seen tanks, vats and barrels there is only so much more you need to see. What we really wanted to do was taste the wine, and at the end of this tour we tasted five of their wines! Five! Mouton – 1; Pichon – 5! Each was beautiful, including the 2009 which was one of the best wines we tasted during the entire trip, even competing with the two 1990’s we had the night before. This is one of the best wine tours I’ve ever done and I highly recommend it if you are in Pauillac. All this wine tasting can really take it out of you so we drove from Pauillac down the magical D2 past more amazing chateau – Leoville Barton, Beycheville, Gloria, and many many more and finally arriving in Margaux where we would be spending the next several nights at one of my favorite places, the Relais de Margaux. It was a good tourist day, but we hadn’t collected any more Left Bank wines for our blind tasting and I am feeling a little anxious that we don’t have enough wines from the Cabernet dominated region for our blind tasting. We would have to wait until Friday to change that. Every trip seems to have a “hump day,” that has too much crammed into it but just has to be done in order to get to all the things you want to see. This was that day. We began with a visit to Uni Medoc about twenty minutes from our hotel in Begadan. Uni Medoc is a huge cooperative that makes wine on a mass scale. This is the opposite end of the spectrum from Thomas, Pierre-Emmanuel, Chateau Bourseau and Patrick. Here they make millions of bottles of wine every year. It is here also, that several years ago we found Le Grand Art and Clement St Jean Reserve. Next year we will introduce you to another wine from this Co-op that is also fantastic. So while I love the winemakers from small, boutique, garage wines, the wines at Uni Medoc also fit into what I’m looking for because they are great wines that are not available in the US. Over the last couple of years I have gotten to know Marie-Dominique – the export manager – and Laurent – the wine maker at Uni Medoc – and I like them both very much. They agreed to give us a tour of their operation and we got to see how a big production is able to make quality wines by focusing on the individual farmers who grow the grapes and proudly put their names on the labels. Their barrel room is massive as each wine of the Co-op is stored separately and shown the care and concern it deserves. We saw the production line as they filled bottles and corked them and it was an amazing tour. We ended with a tasting of several vintages of Grand Art and Clement St Jean and it was a pleasure to taste what a great winemaker can do with the grapes from different growers. Marie-Dominique and Laurent agreed to join us for lunch and it was another beautiful afternoon sitting under an arbor of trees enjoying a long lunch with these two pro’s from the industry and four of their wines. The wines changed as they opened up and were absolutely delightful with lunch. We have put several in the blind tasting and we’ll see how they do, but I am thrilled with the quality of wines they are producing and delighted to work with these great people. We said our good-byes and took off for two more wine stops. First to Chateau Haut Barrel – a wine that we picked last year at Vinexpo – to meet another winemaker whom I had not met before. We stopped by and had a great tasting and chat with the young vigneron who is still working with his father as one generation passes the wisdom of age to another. They have great terroir and are doing some super work. We took two of his wines for the blind tasting and I think he is a winemaker I will want to return to in the future. He made a great wine in the difficult 2012 vintage and I bet he makes a stunning wine in the really great vintages. We’ll find out when we taste his 2015 next year. Our work wasn’t over for the day. One more stop, at Cave St Brice to pick up a bottle of Grand St Brice and a bottle of Chateau La Collonne for our blind tasting. St Brice was my first “puppy love” in Bordeaux. I discovered it in 1999 and the 1996 vintage is still one of my favorite wines of all time. It is the wine that inspired the wine club and I always make my way to this tiny co-op to taste and buy some wine. It is always, shall we say an interesting experience. The woman who sits behind the counter pours the tastings and sells the wine would probably make a great postal employee; in Russia! Nonetheless, I love the wine and while it is the only place I have to pay for the wine, I do it every year because I love the wine. On this particular day we tasted the St Brice and the La Callonne, but the St Brice was so oxidized I couldn’t get a sense of how good or bad it was. I had been open for three days! I didn’t bother mentioning it to her, I just smiled, paid my money, got my bottle and left. We would taste it again at the blind tasting. All in a days work. I was spent. It was only Wednesday and I was crashing. A couple of people in our group wanted to see the Ocean so I gave them the van and I went to my room and tried to take a nap but was awakened by client calls and didn’t get much rest. I knew what was coming for the evening and I wanted to be fresh for it, so even a little bit of shut eye was good. Around 8:00 we walked about one hundred yards down the narrow lane next to the hotel passing small homes and vineyards for as far as the eye can see, to Chateau Le Reysse. I had originally stayed at Hotel Roland de By last year for a couple of nights because I wanted a peaceful place in the middle of nowhere to do some writing, and it seemed to fit the bill. On the first night I took a walk and as I was passing a house along the way I heard my name. It was a very strange feeling to hear my name in the middle of nowhere in France and I was a little startled. I turned and saw my friend Stefan, the owner of Chateau Le Reysse calling me. I had no idea when I booked Hotel Roland de By that it was this close to Chateau Le Reysse but now I was thrilled it was. He invited me to join him for wine and cheese and he opened some great wine as we talked until very late in the evening. He invited me to come again the next night for dinner with his family and I immediately agreed. I had a wonderful time with them that night and I really enjoyed getting to know his family. He also makes a great wine! I was hoping our group would be able to have a similar experience so I had arranged for us to have dinner with Stefan and Hilde, sitting on their patio in the middle of the vineyard relaxing over dinner and wine. Stefan is German, and he moved his family to Bordeaux after he was able to cash out of a big job in Brussels. It hasn’t been easy – although he would never complain – but he has worked extremely hard and is making some killer wines. He graciously welcomed our group and gave us the tour of the place showing off some of the new technology that he is very proud of. After the tour we were joined by his wife Hilde as she prepared a huge spread of meats, cheeses and bread for us to go along with some of Stefan’s wines and everyone loved them. After a while he went to his cellar and pulled out a bottle of 1990 Ducru-Beaucaillou and a bottle of 1990 Razan Segla. I was blown away. I mean these are amazing wines in a fantastic vintage and he opened them for us! The wines were absolutely stunning and showed what great Bordeaux can become as it ages. I think Stefan is making the kind of wine that will someday be as good as these two mega hits were and it’s fun to be in on the front end with him. It was the kind of evening we wanted to last all night, but I knew how gracious Stefan and Hilde had been and I knew they had to get some sleep. Stefan was in the middle of bottling his 2014 vintage and would begin very early the next day. We left around 11:00, said our “thank you’s” and walked back to the hotel. Once there we sat under the trees, opened the Cognac and reflected on the incredible day we just had. I thought about the amazing relationships I have here in France and the wonderful people I have gotten to know over the years. I am thrilled to share these relationships with our group and even more gratified that they enjoy these wonderful people as much as I do. The best news is that I now have some awesome Left Bank wines for our blind tasting: Haut Barrial, Le Branne, Le Grand Art, Clement St Jean Reserve, St Brice, La Callonne, and Le Reysse – all wonderful wines that could all be in the club. Tomorrow was going to be another long day. France is closed on Sunday. Ferme. On Sunday in France there is no commercial activity. The stores are closed, the wineries are closed, pretty much everything is closed. Rather than hang around St Emilion all day, I decided to take the group to Sarlat and Domme since both of these ancient towns are centered around tourism and I knew everything would be open. We left the hotel around 9:00 in order to get to Sarlat by noon, but first we took an unscheduled detour to Monbazillac. As we got close I thought, “It would be a crime not to stop for just thirty minutes,” and so we did. The Chateau Monbazillac sits on the escarpment overlooking the town of Bergerac and the surrounding valley. It is a breathtaking view and a piece of history (a stronghold of French Huguenots) worth the detour. It is also where the best sweet, white wine to have with foie gras is made, so you see, the stop was tres necessaire. We drove on through the windy roads of the Dordogne and I was reminded again – as if I needed to be – why this is my favorite part of France. The lushness of the hillsides covered with vines, the thatched roofed ancient villages that have occupied this land for centuries, the calm pace of life and of course the food! This is ground zero for foie gras and canard, so of course it is also my favorite place in all of France. We arrived in Sarlat around 12:30 and made our way to the center of town, where I have a favorite restaurant for lunch. It is a simple place where you can get a decent omelet, or a croque monsieur, and a pitchet of Rose, and relax and soak it all in. Sarlat was founded in the Middle Ages and did not have major roads to it until the 1970’s. The old town is preserved and as you walk it’s narrow streets you can imagine yourself back in that time. I stayed mostly at the cafe and let the group discover the town on their own. Eventually I poked around a little even buying a hat that makes me look like Uncle Henry in “A Good Year;” well my wife likes it. By 5:00 everyone was ready to leave so we made our way to the cliffside town of Domme where we would have dinner and spend the night at Hotel L’Esplande with our rooms high above the cliff, looking out over the enchanting Dordogne Valley. The next morning we watched the fog roll in across the valley and up to Domme and it was like something out of a movie. It is almost impossible to describe this magical place and the connection to an ancient civilization but here along the narrow cobbled streets filled with artisans and tourists, you can almost imagine yourself as a resident centuries ago with people who were doing pretty much the same thing you are doing now. It was a long detour from the wine tour, but worth every minute. On Monday we were back to the serious business of picking wines for the club so we packed up the van and made the three hour drive to Graves to see my friend Patrick and Chateau Tour Bicheau. I remember meeting Patrick when he was just 28 years old and was still learning winemaking from his father and grand father. Today he is 34, married with a son of his own and his years as a student have paid off. His wine consistently scores as one of the top wines in our blind tasting and in fact it is always sold out every year. His is the only wine I have ever had to reserve before I taste it – with the agreement that if I don’t pick it in the blind tasting I can cancel my order – because he will not have any trouble selling it to someone else. I consider it a privilege to be able to import his wine because I know how in demand it is all over Europe and I know how special it is to have it in our club. In addition to making a great wine, Patrick is also a great guy. He gave us the nickel tour of the winemaking facility – a little larger than the ones we saw in St Emilion, but still very much a family feel to it – and then joined us for lunch at a local restaurant he picked. We had a wonderful dejuner with him and enjoyed a couple vintages of his wine as we sat down for another long lunch. We invited him to join us for the blind tasting and he agreed so hopefully we would see him again on Thursday to taste the Left Bank wines. I usually invite my Right Bank winemakers to the Left Bank blind tasting and vice versa. It is always great to get their perspective on wines that are not from their region; plus I don’t want them at the tasting that has their wine in it. I made that mistake once early on and was extremely embarrassed when I gave a bad review to a wine which, when we took the cover off it was from the winemaker sitting at the table with me. Lesson learned! Never again! By 2:00 – the correct time for lunch to end in the civilized world – we made the long drive up to the northern Medoc and the area of Begadan. Begadan is a good thirty minutes north of Pauillac and is in some ways the last frontier of the Medoc. Before we reached our hotel however I had to find Chateau La Branne. We had selected this wine at last years’ blind tasting, but I had never visited the property so I wanted to stop in, meet the winemakers and see if they had any other vintages for us to taste. When we arrived late for our appointment the matron of the Chateau was surprised to see us. In not a word of English I explained who I was and that I had a rendez vous with the winemaker. She explained that her son was not available, and she called her daughter-in-law who drove over to meet us. We tasted a couple of vintages of the wine and while it wasn’t exactly what I remembered from last year, I did remember why we picked it. We got some extra samples for dinner and I was glad we had stopped there. This is another winery to keep an eye on. They have good terroir and are making good wine. I can’t wait to taste their 2015. Our hotel for the next two nights was Hotel Roland de By and it is a wonderful place in Begadan – aka the middle of nowhere – surrounded by vineyards. Begadan is also where Chateau Greysac is, and more importantly for the club, both Chateau Le Reysse and Uni Medoc. It was a peaceful and quiet place to relax under the trees and enjoy a fabulous Medocian dinner with specialities from the region and a couple of wines we had picked up along the way as we lingered the night away. It had been a long day of driving and I was exhausted but we had covered a lot of ground and now, looking back, we had a great collection of wines for the Right Bank blind tasting. It was now time to start working on finding wines from the Left Bank. Tomorrow. The group arrived mostly on schedule with only a slightly late train and one missed connection holding up our first day. All of France is celebrating Euro 16 and Bordeaux is hosting some of the matches. In addition to the soccer mania, there is also the grand Fete de Vin de Bordeaux – a wine festival held every other year – taking up a good part of the city. In other words the traffic was terrible and it took us three times as long to get from the airport to St Emilion, but we finally arrived, ready to dig into wine world. Our first real wine exploration began the next day as we visited Chateau Reclos de la Couronne and Thomas Thieu gave us the tour and educated us on winemaking. Thomas is a wonderful winemaker and a great guy whom I am pleased to say has also become a friend. He makes a fabulous wine – Chateau Reclos de la Couronne – that we have had in the club for several vintages. He took us through his winery and explained the differences between concrete vats and stainless steel, the process of harvesting by plots and the art of blending. He allowed us to taste the same wine, from the same plot, aging in different oak barrels and experience for ourselves the difference the barrel can make. We saw clearly that the first part of winemaking is science and the second part – the blending – is art. It seems to me that the new world is full of scientist and the old world is full of artist. In the New World the science has greatly improved the wines that are available to the consumer, but in the Old World the artistry of blending from different plots, and different barrels creates a more unique and more interesting wine. Thomas didn’t make a wine in 2013 so we tasted his initial blend for the 2014 vintage and it is great. I look forward to tasting it again next year and having it in our blind tasting then. After our morning at “school” Thomas was gracious enough to join us for lunch at a great little restaurant across the street from his home where we were also joined by Pierre-Emmanual of Chateau Pierham. Pierre-Emmanual brought along a couple of his wines including his 2012 Chateau Pierhem and it was fabulous. I was excited to put it in the blind tasting and to see how it did against the others but I was pretty confident it was going to be a winner. Not many people made a great wine in 2012 but this one seemed to stand out. After a wonderful, relaxing two hour lunch we said our good-byes and thanked them profusely for their time and what they had shared with us. This – the time with my winemaker friends- is my favorite part of visiting Bordeaux every year. These are great men and women who are passionate about what they do and are just as passionate about sharing it with the rest of the world; even me! From Montagne we headed to Lalande de Pomerol and Chateau Bourseau. Again we were graciously met by the mother and one of the sons who own the winery and given a quick tour of the small but efficient winemaking operation. Both Bourseau and La Couronne are relatively small concerns so the tour doesn’t take very long, but it is interesting to see the differences in philosophy and winemaking. We tasted their 2015 from the barrels and the recent blend of 2014 and enjoyed this small family property. While Thomas and Pierre-Emmanual are pretty fluent in English it was a little tough at Boruseau and I had to lean on my French skills which are sketchy at best. The wines however were great and again, 2012 was tough but they made two great wines – Chateau Bourseau and Chateau Croix de Bourseau. They gave us several vintages for our blind tasting and now, including the wines from Cotes de Blaye, we are beginning to get a good collection to choose from. I like all these people and want to include all their wines in the club which is why blind tasting is so important. I have to make sure the wines are good and that I’m not just choosing a wine because I like the winemaker. It was difficult to not take Pierre-Emmanual’s 2011 Chateau Pierhem last year but I just didn’t like the wine in the blind tasting and there was no way I could include it. We’ll see how his 2012 does. I can’t imagine the day I have to tell Thomas that I didn’t choose his wine – and I hope that day never comes – but if it does, then I will do it because without great wine we don’t have a great club. It was a wonderful day of tasting and learning and we returned for dinner in St Emilion and then Cognac back at the hotel as we processed what we had learned that day. We were off to a great start, but our tasting was going to be put on hold for a day because the following day was Sunday and noting happens in France on Sunday, not even wine tasting. I am sitting in a quiet café in sun drenched St Raphael on the Cote d’Azure spending the afternoon relaxing and catching up after an amazing week in Bordeaux. This years wine trip was a group tour that was an eight day extravaganza beginning in St Emilion, venturing to Sarlat and Domme, then back to Graves, up to Begadan, on to Pauillac and finishing in Margaux. We visited nine wineries and two Cave Cooperatives, toured a barrel factory, stayed in ancient cities and ate more amazing meals than I thought humanly possible. In other words, it was a fabulous time! Over the final two evenings – and one afternoon – we blind tasted almost forty wines to select ten for the club. I won’t torture you any more with the tourist recap but I will try to highlight the wine searching part of the trip and bring you up to date on what we discovered. Vinexpo is every other year on the odd years (2013, 2015, 2017 etc.) and it is the easiest way for us to find new wines and new winemakers. With the wine world gathered in one place for a week it is easy to taste one hundred wines a day and really narrow our selection for blind tasting. On the even years we have to do more selective searching and this year was one of those years. I landed in France on June 9th and for the entire first ten days the weather was cold and rainy, but fine for wine tasting. I spent the first couple of days near St Foy le Grande getting acclimated and poking around the Montravel region, which is just east of St Emilion between there and Bergerac. They make some great wines (Chateau Laulerie is from here) and it is an up and coming region that I want to explore more. This time however I didn’t find much except the free bottle of wine they left in my hotel room – which I didn’t even open but decided to stick in the blind tasting just for the heck of it. My friend Eric joined me and our serious searching began a couple of days later –as we spent three days in Cote de Blaye. Cote de Blaye is north of the Medoc and across the Gironde river from Margaux and Pauillac. We have only imported one wine from this region of Bordeaux over the last ten years (1999 Roland de Garde) and have mostly ignored it because we have found such great wines in the Medoc, St Emilion and Pomerol. There are good wines here and it was time to dig in a little deeper. With eight thousand wines produced in Bordeaux every year I have to have a way to sort through them to find the great ones. My strategy is to find a good local restaurant with a large wine list and over dinner I begin a conversation with the waiter or sommelier. I let them know I am an importer from the US and ask them to recommend wineries for me to visit and taste. They are usually locals who know the region well and are very familiar with the wines. This is how we found the aforementioned Chateau Laulerie. I also ask my current French contacts for recommendations. We arrived in the town of Blaye in the evening and by the next afternoon I had a list of about ten wines to taste and four wineries to visit so we started making appointments for tasting. I had never heard of most of these wines, but as I tasted some of them at restaurants and visited the various chateaux I was impressed by the quality of the wines. This area is mostly merlot based and reminds me a lot of St Emilion at typically a fraction of the price. 2012 is a tough vintage in Bordeaux. After two great vintages (2009 and 2010) they struggled with an aggressively average vintage in 2011 and then an even more difficult vintage in 2012. 2013 was a complete disaster and most of the good wineries didn’t even make a wine – or at least they didn’t make their “first” wine. Chateau Pierhem, Chateau Reclos de La Couronne, Chateau Beau Rivage and Chateau Tour Bicheau did not make wines. They sold their fermented juice to negotiants to make wines for grocery stores. On our trip we tasted mostly 2012’s and it is not a great – or even good – vintage. It is not as bad as 2013 but it is not great either. The wines are typically thin and uninteresting. Be careful when you are buying wine in the store and stay away from the 2012 vintage in Bordeaux. We have been very selective and have found a few we feel great about including in the club but it has taken a lot of work to sort through the plonk to find the really great ones. After our three days we had nine wines from Cote de Blaye to put in the blind tasting and next year I am going to make an effort to track down more of these wines at Vinexpo. One of the wineries still had some stock of its 2002 and 2003 vintage. We put those in the blind tasting and I’ll let you know how they did. We were off to a good start to the trip and I was looking forward to seeing the group and showing them my Bordeaux. I’ll tell you about that in the next letter. There are three basic things that can go wrong with a wine and it’s good to know what they are. 1) It’s corked. This is the most common problem with a wine and this was what was wrong with the wine that night. “Corked” happens when a bacteria has entered your wine and ruined it. There is nothing you can do about it. You know a wine is “corked” if it smells like a wet basement. That musty damp smell means the wine is corked and should be discarded. Occasionally the stink will blow off – but that rarely happens. You should not drink a corked bottle of wine; you should throw it down the drain and open another bottle. Estimates are that about 10% of all wine is corked and this is one of the strongest motivations pushing the industry to find other “closures” – synthetic corks, and screw tops for example. 2) The second most common flaw in a wine is when it is oxidized. This occurs when a wine has been exposed to oxygen for too long and is moving towards becoming vinegar. The most common problem with wine by the glass in a restaurant is that it is often oxidized. The restaurant opens a bottle of wine for dinner, doesn’t finish the bottle and puts a cork in it. The next day they are going to finish that bottle before they open another one, but by then it is becoming oxidized. I often ask my server when the bottle has been opened before I order a wine by the glass. If the restaurant serves a wine that is oxidized I simply send it back and ask them to open a new bottle. Freakishly, it is common in France for them to drink oxidized wine. I don’t know why; it just is. 3) The third major flaw – and the least common – is that a wine is cooked. This happens when a wine has not been stored well and has been exposed to too much heat. I once bought a bottle of a pretty well known wine that was on sale at a very inexpensive price. The merchant had a case and I was suspicious so I bought a bottle and tried it that night for dinner with friends. The wine smelled and tasted like stewed tomatoes. It was awful. It was cooked. I think the distributor knew the wine had not been stored well so he dumped it to the retailer at a cheap price to try to move it, hoping that inexperienced wine buyers wouldn’t know what was wrong. The real problem with not knowing that you’re drinking a bad bottle of wine is that you might think you don’t like that particular wine and never give it another try. You drink a bottle of wine that is corked, oxidized or cooked and say, “that was awful; I’ll never buy that wine again.” It is important to learn what the key flaws in a wine can be and spot them so that every bottle you drink is the wine the winemaker intended you to drink.